Coronation scene of Seti I, ,Seti I, King Seti I, Seti. This relief shows King Seti I on his throne at his coronation carrying the crook and flail scepters symbols of kingship, wearing the Atef crown and supported on one side by Edjo, the cobra Goddess of Upper Egypt and by Nekhbet, the vulture Goddess of Lower Egypt in the missing part of the relief, both in the guise of elegant Queens. A capable ruler, excellent field commander and energetic builder, Seti I embarked on a series of military campaigns in an effort to secure the boundaries of Egypt, echoing the achievement of Kings of the XVIII dynasty before Akhenaten. The sculpted reliefs of this reign attained a degree of refinement rarely excelled, particularly in the colorful scenes of the Abydos temple and his royal tomb in the Valley of the Kings. The tomb, the deepest and longest in the valley, established an entirely new type of layout, an extended tunnel decorated with elaborate representations of the journey of the sun, incorporating the king, through the night sky and the mysteries of solar rebirth. 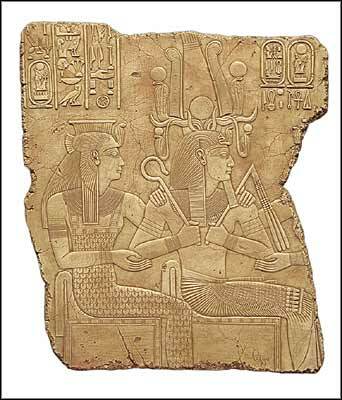 Seti I was seceded by his son, the famous Ramses II The Great.